A crunchy finger food needs a creamy or tangy dip to complement it! You can serve lip-smacking dips with vegetable strips, bread cubes or chips, as starters at a party or as a light evening snack. 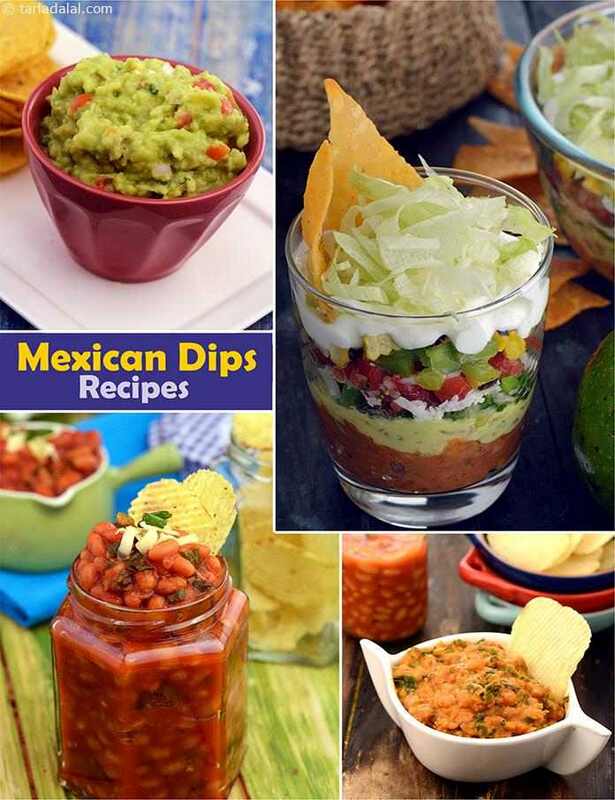 Try your hand at amazing choices like the Green Tomato Salsa Dip, Fresh Tomato Salsa , Black Bean Dip, and Avocado Dip. A flavourful and healthy Avocado Dip, Guacamole originated in Mexico but has now become popular all over the world not just as a dip but also as a salad dressing and sandwich topping. Ensure you take ripe avocados to avoid a raw taste that displeases the taste buds! Once you have made the right choice of fruit, there is nothing more to this dip that chopping and mixing in varied ingredients like tomatoes, onions, garlic, etc. Very quick and easy to make mayonnaise at home. So lets start and say bye bye to very expensive market side mayonnaise. This quick version is a real funto make. Creamy and spicy chipotle sauce that goes ultimately well with subway style sandwich, mexican dishes, burgers, salad dressings and even as a dip with grilled sandwiches and cutlets. A wonderful blend of tomatoes, beans, peppers and herbs, Mexican dip is a Mexican delight. Relish spicy salsa sauce dip with homemade tacos or nachos.